what i have to do to apply for the support? or some team have fox floats to sell or something like that? Before you get started on the frame make sure you are doing what your faculty wants. Last year was our first year competing. It took three years to pull a proper team together and turn around our program. Personally I think you need to build a strong foundation to have a successful program and a prototype isn't a strong foundation. When we started out, we did a lot of planning. You need to list exactly what components you will use in your project. In order to build the list you will have to do a lot of research (it sounds like you've started which is good). I know its not what this competition is about but its always a safe bet to watch what others are doing and use that as a baseline. Once you have this list start constructing a budget. Overshoot your projections and plan to spend more then you actually will in the end. 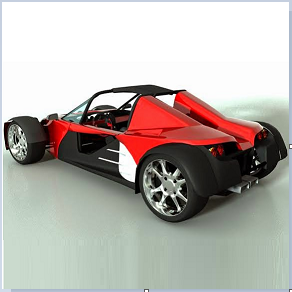 If possible try to design as much of the car as you can in CAD. From there you will know exactly what your up against and you have to ask yourself two key questions. Where will the car be built and how will it be paid for? If you can convince your school to provide space make sure you can get a lot of access to that space. You will have a hard time building the car on an 8 hour day. Last year we were spending 18-20 hour days in our shop the month before competition. If your school isn't willing to pay for the entire project (which is highly likely) you will have to come up with some kind of sponsorship proposal. I almost forgot. After you put together the spec sheet for your car you need a build schedule. This is key. Plan extra time! We planned an extra month and finished our car on the way to competition. Below is a link to our sponsorship page. Our budget, sponsorship proposal and timeline for the 2011 season is all on there. 2011 was our first year. Like I said it took us 3 years to get to this point. Hopefully this helps you cut down that time. Adding onto what luke said, I would buy as many items used as possible. Anything from wheels,tires, knuckles, A-arms, gearbox etc. used off ebay. Building a frame around existing components will simply things tremendously, aka quick progress. After you get a running vehicle then you can go back and possibly make your own components for whatever reason your team decides upon. Our team has been going for the last 20 years, but I know the first few years were extremely basic. As Erik says, lots of stock parts are your friend. 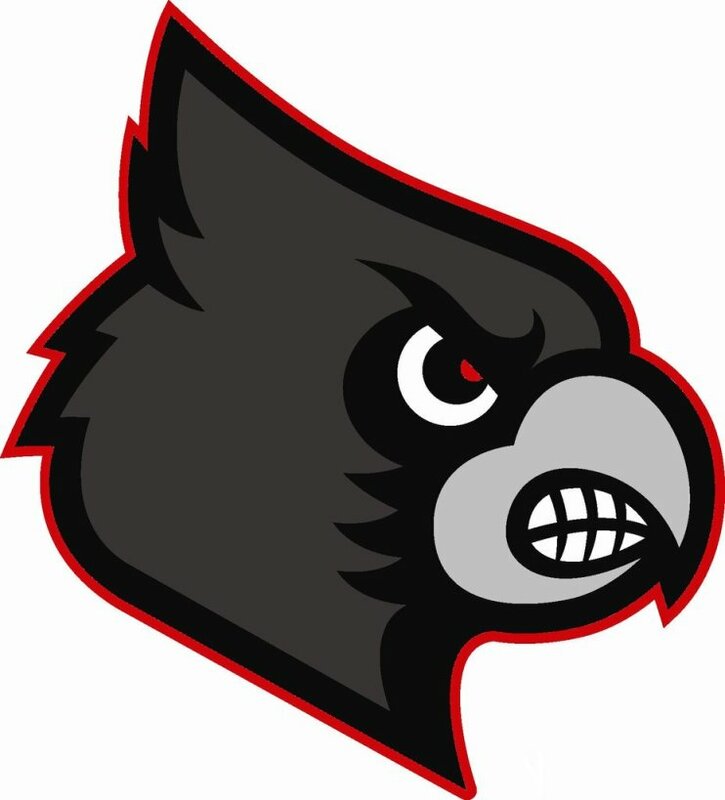 I am sure you can get a lot more than you think out of sponsors (I know we do, our school isn't very funding-oriented) even though the team is young. If you can afford it, take the team to a competition. At least an invitational if not a full blown competition. Find one of the team that is traditionally competitive then ask lots and lots of questions. 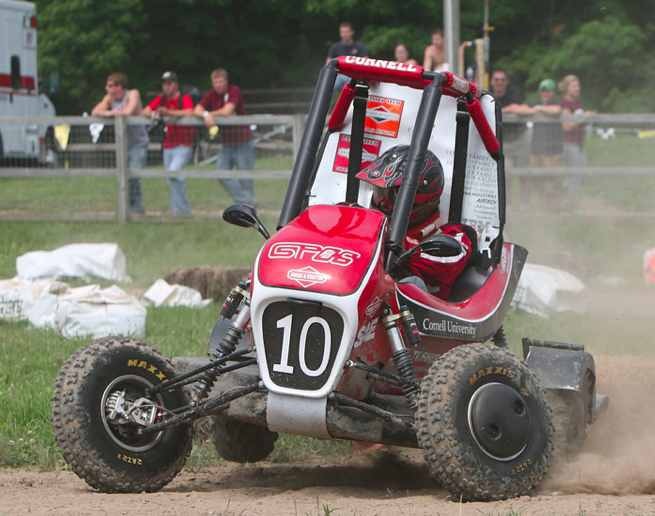 We traveled to Ocala in '07 after our young team wasn't able to complete the modifications to the previous years car. We took a ton of pictures and video, and talked to a lot of people on competitive teams. The things we saw and learned play a role in choosing our designs in '08. I feel like the project management portion of the competition is just as important, if not more, than the engineering/fabrication side. If you can't secure funding to build the car, it doesn't matter how sweet your design is. If you can't secure transportation and travel to get to competition, once again it doesn't matter how awesome your car is. Hello, it is my first post here. My name is Lucas Schmitt, and me and some colegues are also starting a new team in our institute. We expect to participate on our first oficial competition in Agoust 2012. As you said we tried to buy as many use parts as possible so our draws would be better. Thanks! Its a pleasure to participate of this! My first question is where is the rest of your frame? Mainly the back half. Compared to FEI they are only missing about 2 bent bars, but thats what you get with a stressed gearbox, stressed engine and front braced car... I am guessing that hasn't been a priority yet. What kind of drivetrain are you planning to use and how much thought has gone into designing that swingarm? It looks like a good first attempt to hammer out some basic things but there is a lot you can still work out. The car is only half design, motor compartment, transmission and rear suspension were not touch yet. They are there just to see the basics and space. Our motor is coming so we are waiting to draw the back end properly. We will use Comet CVT 780 as transmission. I realize that you didn't intend to have a structural drivetrain which is a good idea not have as a first year team. I was simply making a joke that you had almost the whole frame by FEI or UMBC's standards. We also design the front frame first which is primarily set off of our front suspension geometry. Make sure that when you design the specifics of the rear suspension you tweak the front as needed. They are very much not independent and you should pay a lot of attention to your roll center axis and other important links front to rear for a car with nice handling. The comet is a fine way to go. We have used the Comet, Polaris, CVTech, and a modified CVTech-Polaris combo. All of them can be tuned well and the Comet is nice and simple. I would also consider the CVTech since it is simple, cheap and a good performer as well. That car looks incredibly uncomfortable. It looks like the knees are nearly touching both the SIM and the steering wheel. I realize the Brazilians build smaller cars, but this looks like it would cripple you after a 4-hour endurance race. are you referring to rule b8.3.5? i was hoping to update our schools old frame but i think this may now pose a problem. the frame has no fbm's but the sim's are indeed in two pieces. Thanks for your reply, we are still working on the model. Searching on the web came up one doubt on my mind. I searched in this forum many times but could not find any thing. When using CVT i also have to use clutch? I mean even in the smallest reduction the wheels will keep turning. Or the cvt has some centrifugal clutch already?? When setup properly, the CVT reaches a point where the belt is loose and slips. At this point the car will not move. As the engine speed increases, the sheaves pull closer and begin grabbing the belt. It sounds like you need to do a bit more research on CVT's. How you setup your CVT is extremely important. It depends on the configuration of the transmission system. If your system has only one reduction after the CVT will not need a clutch. If you have more than one speed after the CVT, like low+high+reverse, will only can change when the car is stopped if don't have a clutch. Thanks, now i get it! Lucas how did the rear end of the car hold up in the brazil race? Kelly as far as the Orginal thread was started, This is our 12th year as a community college racing in the series. This is our 6th frame, and we have learned and forgotten lots over the years. Its very hard at the 2 year school level. I suggest buying lots of parts, and go from there. We make most of our stuff, and its very hard to do with such new members. Lucas does your car tyre tilt when taking a turn as shown in your profile pic?? If so how did you achieve it?? Camber Gain while cornering is achieved through Suspension geometry design, please read racecar vehicle dynamics by Milliken. I'm going to be extra nice today... CASTER. Caster combined with kingpin inclination will cause the tires to "tilt" during turning. Most cars have body roll toward the outside of the turn, and they don't have a lot of camber gain. That means the tires end up straight up and down during corners - rather than "tilted" out of the corner (if they had no caster). Caster also affects steering forces - a lot. Side note after this thread has been dug up from the dead - we used a very similar design of knuckle for the 2015-16 season. This thread was from 2012-2013. What are the steps to go to competition? I mean the steps to register the team and what needs to have the captain, the membership or how? First off, welcome to BAJA! 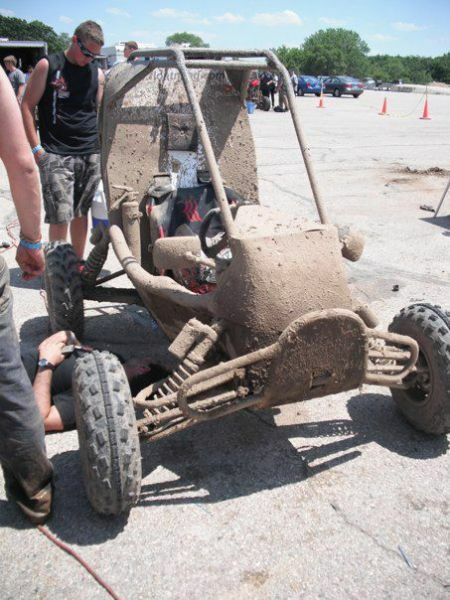 It's great that you want to participate at BAJA SAE, the experience is incomparable. Coming to your query, it would be better if you could ask really specific questions related to chassis design or any subsystem after doing some research yourself. To be honest, "any recommendations" will generally give you "no recommendations". For some reason, I also cannot access the image you uploaded. Thanks for replying!, being more specific, how good or how bad do you see the geometry of the chassis?, and do you think that this structure distributes the road and impact forces in a good way throughout the whole chassis? 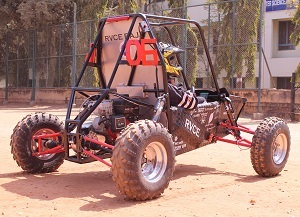 My first reaction to the images would be that the rollcage design looks similar to any other BAJA rollcage designs that you see. But using terms like "how good", "how bad", "good way" etc. will not tell you much about your design. I recommend you come up with quantifiable terms which would help you really assess the tips and tops of your design. Coming to "force distribution" in your rollcage, one cannot look at an image and decide on that. I recommend (if its not already recommended) you do a CAE analysis of your rollcage. 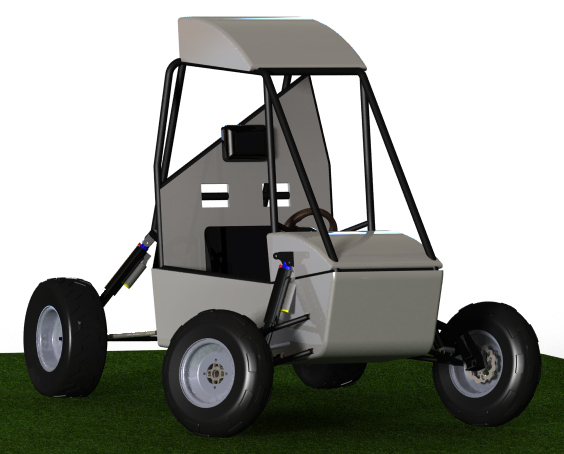 One more question, is there a recommended software besides SolidWorks to model and see the behavior of the suspension mechanism? A lot of teams use CATIA, UGNX etc. for modelling almost everything in BAJA. Coming to behavior (kinematic and dynamic), Adams is quite popular especially in the vehicle dynamics community. 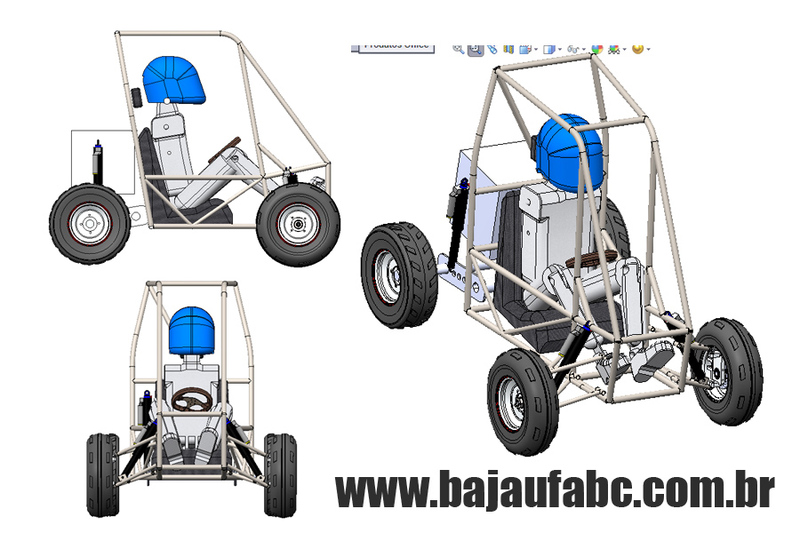 But you can find a lot more if you just search this forum and read some BAJA design reports.